Silver Hawk SMR 1234 (now sadly deceased) was a grulla (i.e. black dun) roan Cerbat stallion. Thankyou to Marye Ann Thompson of Apache Trail Ranch, Willcox, Arizona for sharing this lovely photo with us. 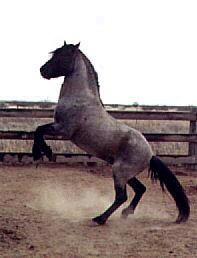 The bay roan is also a Cerbat stallion.